Sidewalk signs are signage placed along the curb or exterior of a property to catch passersby's attention and encourage them to come inside. Made of a simple structure, these signs are portable and convenient for display and storage. Businesses can quickly put them out when open and bring them back in by the closing hours. The bold graphics, flexible messages, and cost-effectiveness make sidewalk signs an ideal sales driving visual communication. It helps customers navigate to hard to see locations and works great to promote temporary offers. Depending on your curb space available and property restrictions, RainMaker Signs offers the following types of sidewalk signs: a-boards (a.k.a. sandwich boards), blade signs, banners, and flags. With a structure like the letter "A," the A-frame sidewalk signs are one of the common signage passersby see along the curb of a retail store. The double sided graphics capture attention of potential customers coming along both ways of the street. Being portable, A-boards are convenient as a temporary signage that businesses can conveniently relocate to minimize pedestrian traffic disruption but maximize promotion results. Hung above the ceiling adjacent to the storefront, blade signs are the beacon customers look for as an identification of their destination when they come up close. Similar to how A-boards function, blade signs attract attention of the oncoming pedestrians and give them a call out to welcome them in. Blade signs are a permanent fixture rather than a temporary and portable solution. Horizontal vinyl banners and vertical retractable banners are other types of sidewalk signs ideal to create curb appeal. Bigger in size, these visual communications make bold impressions and share more information to passersby about store happenings and promotions. A wave of flags along the curb make a stunning impression to pedestrians and drivers about the establishment they passed by. The vibrantly colored flags come in different shapes and sizes. Made of soft fabric and supported by a strong stand, these flags are great to showcase branding. 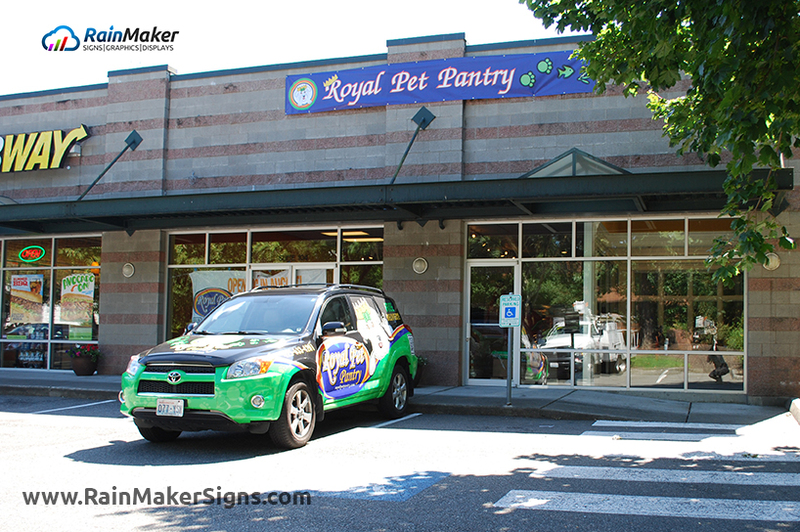 RainMaker Signs Offer A Variety Of Sidewalk Signs To Support Your Retail Strategy!